Before choosing a grill, there are four questions you should ask yourself. What kind of cooking will the grill be used for; burgers and hotdogs, searing and cooking full cuts of meat, roasting whole chickens and turkeys, or as a slow-cooking smoker? How often would the grill be used? How many people would the grill cook for at one time? How much are you willing to spend? 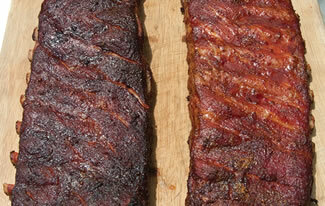 Gas grills can be a huge time saver when compared to charcoal. With a charcoal grill, the user can spend 20 minutes igniting coals and achieving an evenly-built fire. Using a gas grill, all the user needs to do is flip a switch or press a button to ignite the burners. If you enjoy grilling after coming home from work, a gas grill can have your family’s meal ready to eat within one hour. When shopping for a gas grill, there is a wider price range ($35-5,000) and a bit more to research. Charcoal grills are less expensive than gas grills when comparing grills of similar build-quality, but fuel costs for a charcoal grill can be 5x, 10x, or even greater than that of a gas grill. While wood chips can be used in conjunction with a gas grill to impart a smoky flavor, a more authentic Southern-style, slow-cooked, smoked barbecue flavor is achieved by using a combination of charcoal and wood. With this said, most large barbecue restaurants today smoke their meats in large, natural-gas powered machines made specifically for smoking, but these are not all-purpose grills built for your everyday consumer. Generally speaking, charcoal grills are more simple pieces of equipment and will therefore last longer than gas grills of similar build-quality. Charcoal grills also pose more of a fire hazard. They should be kept away from flammable structures and off of high balconies. While natural gas grills must be hooked to a natural gas line by a professional, the cost of natural gas is far less than the cost of propane (many sources report natural gas as having a cost half that of propane per million BTU’s). Natural gas is often considered as more safe than propane. This is because propane is heavier than air, whereas natural gas dissipates relatively easily into the air when released. Propane grills, however, are more portable as they do not have to be permanently installed into a gas line. Gas grills under $50 are generally considered not to be worth the money as they often last for only a couple of seasons. They are constructed from thin sheet metal and the cheapest components possible. These grills are fueled by small, disposable propane cans and top out at around 12,000 BTU’s (though most provide significantly fewer BTU’s). The biggest upgrades within this category are in the grill’s size and fuel source. Fuel in this category generally consists of larger, refillable propane tanks as opposed to small, disposable cans. 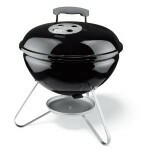 The construction is slightly higher quality than grills in the previous category, using lightweight steel or aluminum. The size of the cooking area is nearly double that of grills at or under $50, and the grill may even come with an extra, low-powered burner. The grates included with grills priced between $50-$150 may warp over time and will eventually need to be replaced. In this category, consumers can expect to receive 3 or 4 burners and an output of approximately 20,000 BTU’s. A cooking surface of about 400 square inches is typical, though the grill will still be constructed from thin metal. Because of this, performance may suffer in cold weather. The steel grates included with these grills are covered in porcelain and may not warp, but may chip over time. Replacing these grates will generally run $30-$60. Grills within this price range tend to be constructed from thick-gauge steel or heavy cast-aluminum with stainless steel burners. Because they are much more durable than previous categories, 5-10 year warranties are usually included. Within this price range, there is not a significant upgrade in size, with cooking areas ranging 400-500 square inches (good for serving about 15 people). Compared to previous categories, there are plenty of upgrades to be had in this tier. 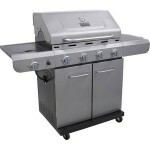 Here, grills offer approximately 40,000 BTU’s, even heat distribution, and precise controls. Generally, these grills are constructed from high quality stainless steel throughout. At at least $1,000, expect a cooking surface of approximately 900 square inches. The heavy, cast-iron grates included with grills in this category will not warp over time, but they do need to be oiled regularly to protect them from rust. Throughout this category, the consumer should expect to receive useful accessories such as a rotisserie with motor or extra storage space. Companies that offer grills in this category tend to offer better customer service, 10 year warranties on the burners, and 25 year warranties on the body. 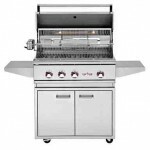 Construction in this category is top of the line, and the warranties offered with these grills will cover components for between 10 and 25 years. Spring assisted lids for easy opening and closing are common within this tier, and the number of burners increases to approximately 6. Extras typically include an infrared sear-burner, capable of reaching temperatures of at least 700 degrees Fahrenheit. Rotisseries with motors are common, as is extra storage space. Interior and exterior lighting is a unique perk offered with many grills in this category. 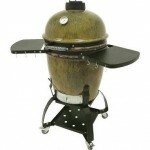 Charcoal grills at $50 and under consist of small-but-functional (1 foot in diameter) kettle-style grills without legs. If one has legs, they will be poorly made and unstable. Grates that come with charcoal grills in this category are thin and will warp over time. This price range includes charcoal grills that are 19-22 inches in diameter and are able to cook about a dozen burgers at one time. Because the lids on these grills are so shallow, cooking whole chickens are turkeys is not an option. These units will not be large enough for smoking or slow-cooked barbecue, so consumers will be utilizing the most basic cooking methods. The steel grates that come with these grills are also very thin and will warp over time, costing $20-$50 for a replacement. 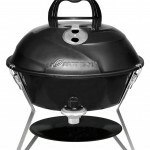 These charcoal grills are great for indirect cooking as well as for cooking for larger groups, as these kettle-style grills are typically 22-26 inches in diameter. Many consumer consider these to be smokers as well as grills, but they lack the precision of airflow required by a dedicated smoker able to produce traditional, slow-smoked Southern barbecue. Grills in this category tend to pile on accessories or other convenience-adding features as opposed to being larger in size. 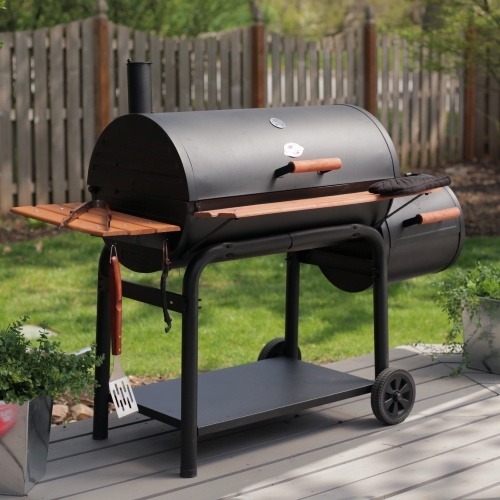 Some of these accessories may include a propane ignition system to light coals with little effort, a removable basin to facilitate easy ash-removal, and hinged cooking grates to easily rearrange, raise, or lower the charcoal without having to first remove the food. These grills are great for consumers who grill often. Grills priced at $300 and up have a wide variety in styles, materials of construction, build-quality, and accessories, but there are a few similarities between most of these grills. They often double as dedicated smokers. 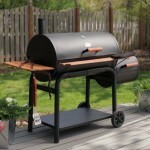 At $300+, the consumer can find steel barrel-style grills that look like a large, 55-gallon drum cut in half. At $700+, ceramic Kamado grills/smokers, like the coveted “Saffire Grill,” are available. These ceramic grills offer unrivaled heat-retention and are chemically inert, meaning it will be impossible for any of the materials of construction to leach into food, regardless of how fatty or acidic it may be. This is an added layer of protection from off-flavors transferring to the food. The primary drawback of ceramic-style grills is that they are small relative to their price.